A daily meal-replacement shake is not utilized for weight management most of the time. Yet, it’s easy and affordable. If you work in an office, you can make it before work and take it to work and put it in the refrigerator until lunch time. 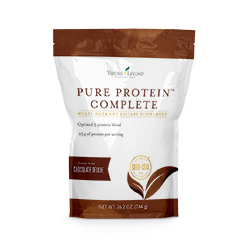 With Young Living’s chocolate Pure Protein Complete meal replacement, you can use milk or water, a banana, and some granola to really enjoy your shake. It will fill you up and it’s delicious. Click on the picture below to get yours today. Remember Enroller and Sponsor number: 1085586 when ordering online or by phone. This entry was posted in Weight Loss and tagged natural weight loss plan, natural weight loss powder, Pure protein complete, weight loss. Bookmark the permalink.